You may not wash your sofa, but you can wash its cover! It's easy to keep it clean by machine washing in cold. Chair seat width and length 16-20"
Notice: Colors may slightly differ due to different monitor settings or screen resolutions. Materials: 85% Polyester 15% Spandex. Highly elastic to fit the majority chairs and thick enough to protect chairs again dust, stains and other damages. Soft fabric chair covers will give your chair a new look. Fit Size: Chair-back height 18-23'' and chair-back width 15-17''. Chair seat width and length 14-18'' and thickness 1.5-4''. Please see measuring guide and measure before ordering. Easy to install and care for. Machine Wash Cold. Do Not Bleach. Not Ironing. Our chair seat covers are Anti Mite and Anti oil. Perfect for for hotel, wedding banquet, meeting, celebration, ceremony, family dining room decoration, Christmas & Thanksgiving and all holiday events. 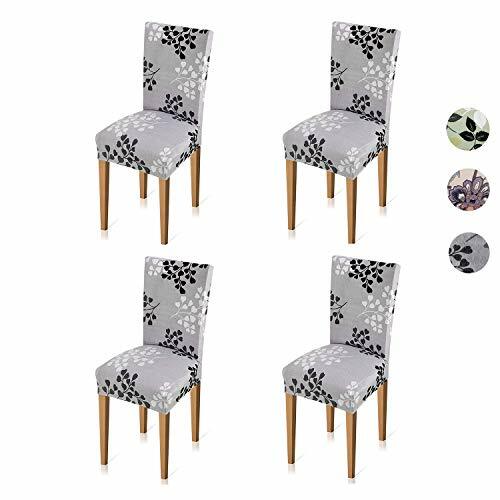 Package Included: 4 x dining chair slipcovers. 180 days warranty. If you have any questions about this product by Xflyee, contact us by completing and submitting the form below. If you are looking for a specif part number, please include it with your message.